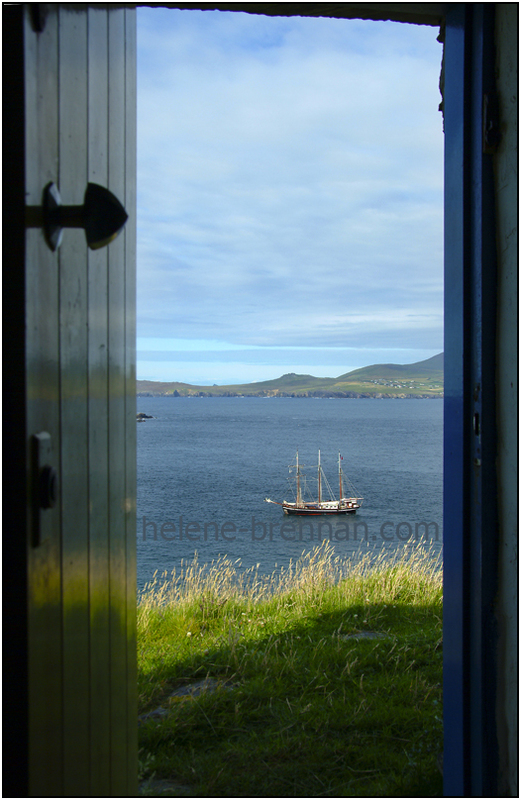 As promised, this is Part 3 of my post on Great Blasket Island, which is off the Dingle peninsula, County Kerry, south-west Ireland. The gorgeous visual beauty of the island and the glorious views provide great delights for visitors. 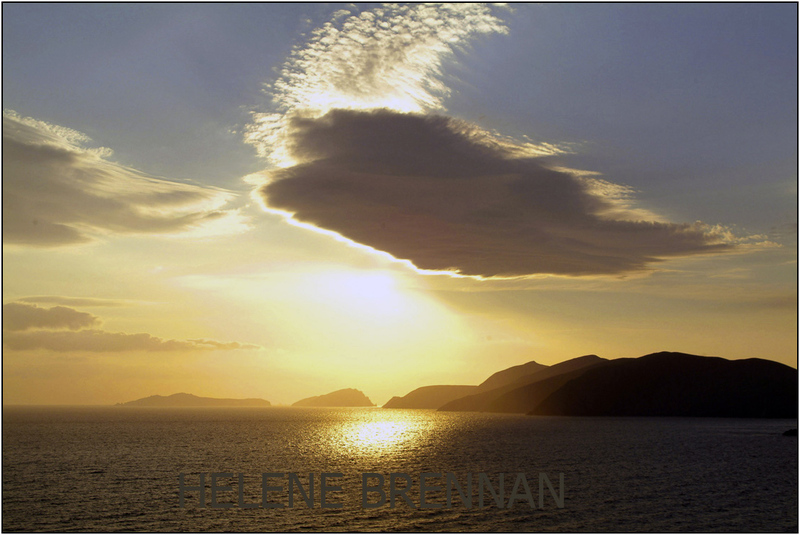 The familiar landmarks on the mainland – Mount Eagle, Cruach Mharhain, Sybil Head, Mount Brandon, Dunmore Head… and of course the other islands of the Blasket group all conspire to present a feast for the eyes and soul. 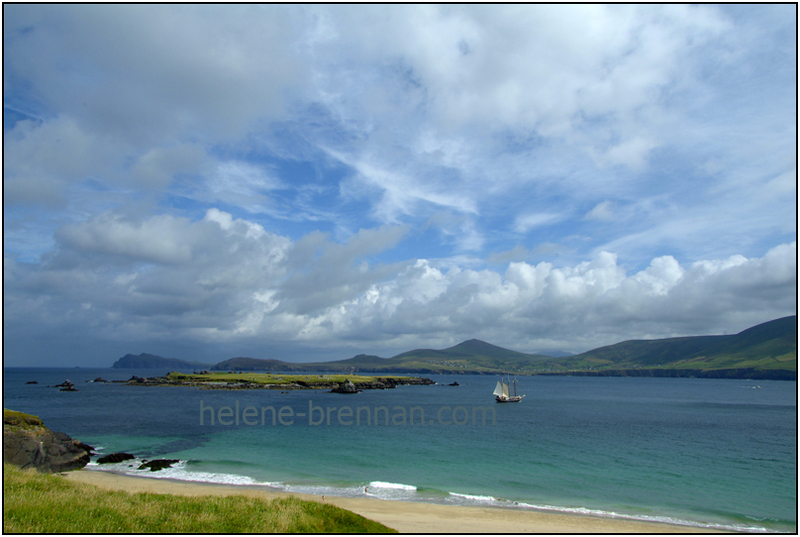 Walking around and along the length of the island is such a pleasure and a privilege. 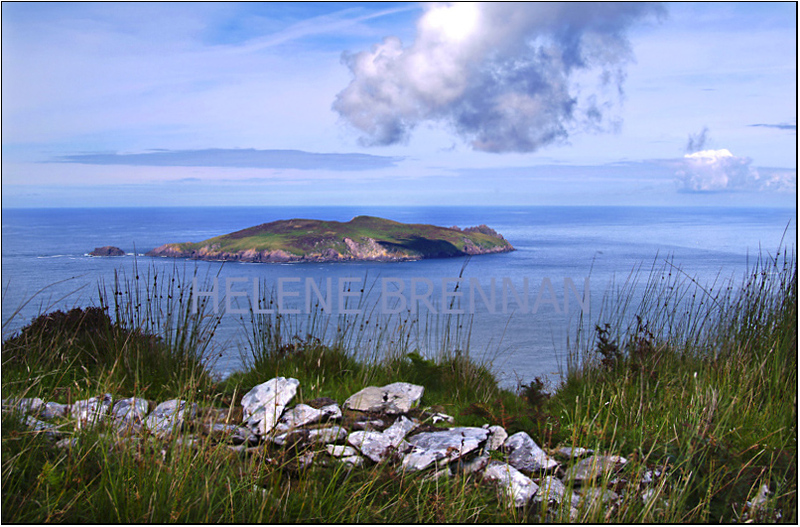 Sitting on a rock in a heathery hump, observing the slow passage of feathery, fluffy and puffy clouds and the swell of the blue ocean with ribbons of white trailing the contours of the land, while enjoying a simple sandwich and contemplating the splendour of our natural environment, cannot fail to re-affirm your values (if needed). 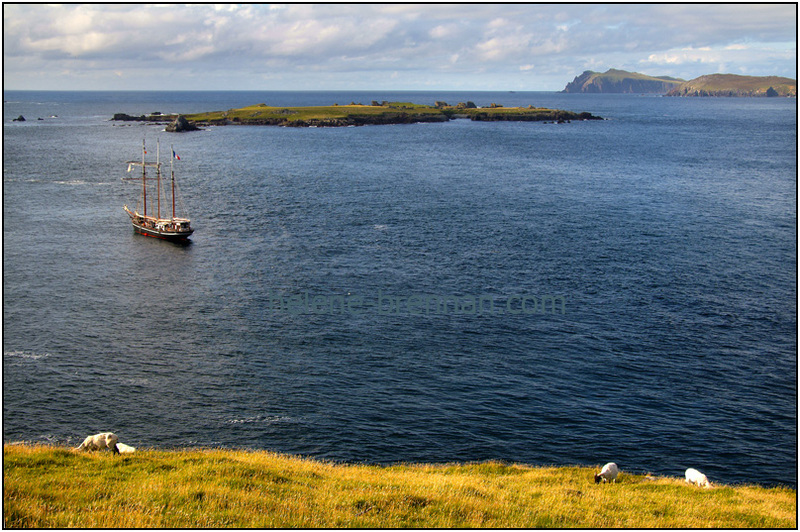 The island Inis Tuaisceart – also known as The Sleeping Giant, or The Dead Man, as seen from Great Blasket Island. The sleeping man shape not so obvious from this view. 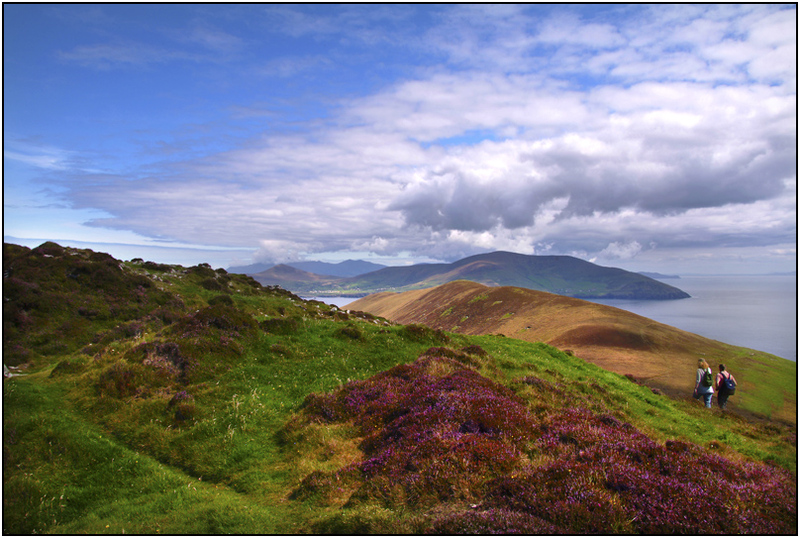 The island, like many remote islands, has its own unique ecology. Wildlife on the island is a special reward, especially so for those who are experts in the fields or ornithology or biology etc. But even for those of us who are no experts, but who have an appreciation for the wonder of all the earth’s creatures, there is great enchantment at even the sight of a humble rabbit, of which there are many on the island. 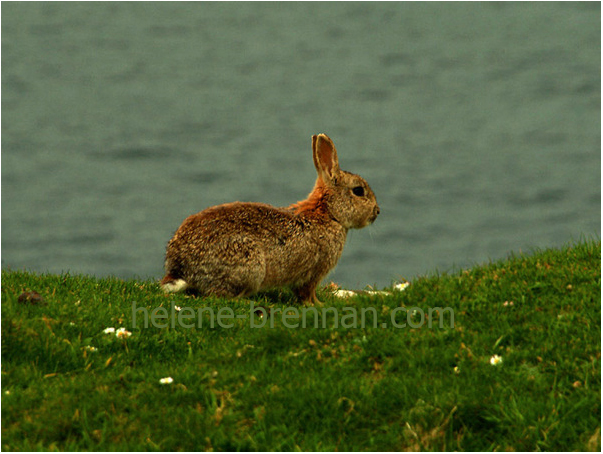 I recently caught a fleeting glimpse of a hare – scampering away at the speed of light. Hares are not indigenous to the island, having been introduced by man’s interference with nature for his own dubious reasons. Nice quiet place for a nap – no tourists down there! 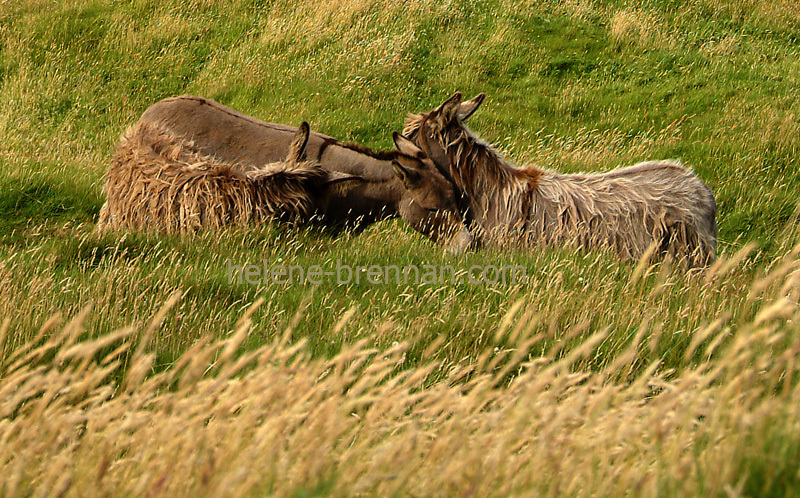 There are sheep kept on the island, and a few donkeys are left to roam free most of their time, much to the delight of visiting children. I once watched with amazement while a donkey led his harem of females to the field of choice to settle down for the night, and then proceeded to move all the sheep well away from that field. He walked and walked, his head nodding up and down and the sheep all across the fields in the area in front of him slowly moved towards the setting sun, and when he was satisfied that the sheep were far enough away, he walked back to rejoin his ladies. I concluded that this was his habit at the time, and the sheep probably knew the drill. The seals are a big hit with visitors. They are usually seen just off shore during the day and when the visitors leave they come up onto the beach. They are usually too shy to hang about when humans arrive. At night they make some very eerie sounds, their howling and wailing being reminiscent of the stories I heard as a child of ghosts and banshees. Thankfully, I don’t believe in ghosts, so it doesn’t worry me. 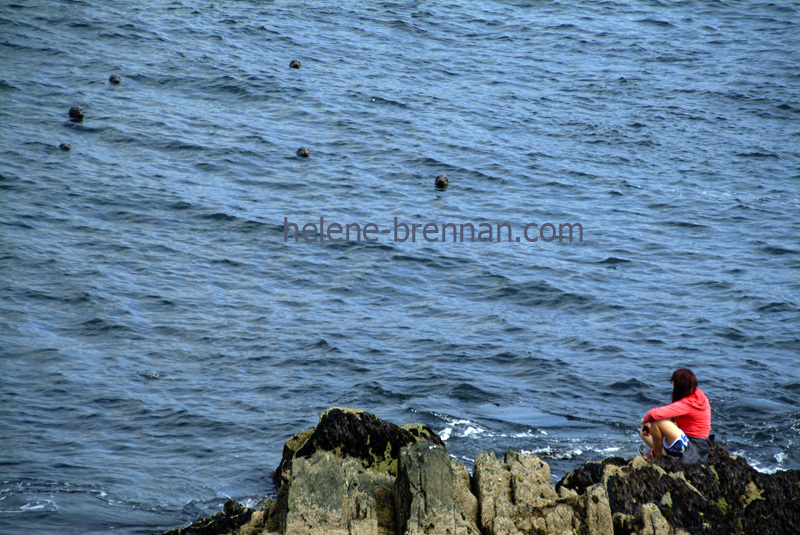 All seal eyes on the human visitors on dry land.They appear very untrusting – not surprising as there have been reports of mass slaughters of seals on these islands. The nights also bring the strange, unmelodic calls of the manx shearwater as they return in their thousands to their colony under cover of darkness. This is one of the largest colonies in Europe. On my recent stay on the island I did not hear so many, and whether their numbers are diminishing or if they just vary their itinerary or timing according to weather and lighting conditions I’m not sure. 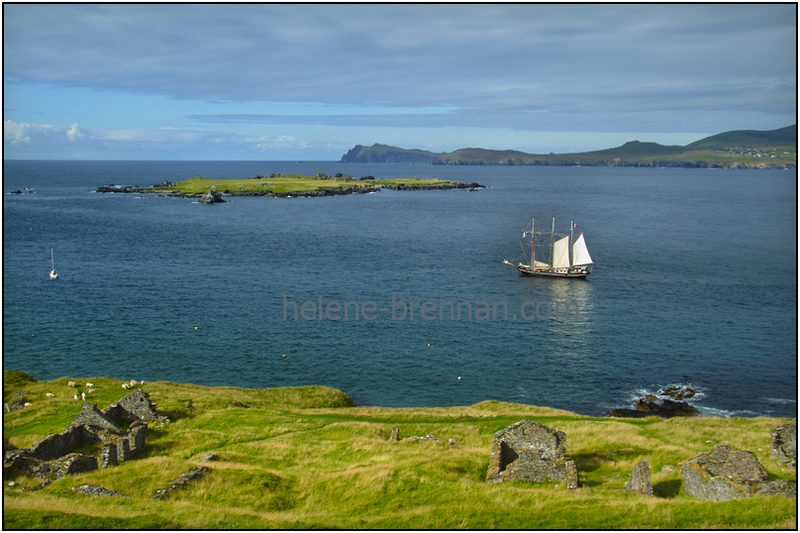 There is also a major colony of Storm Petrels – most of which nest on the Blasket Island of Inis Tuaisceart. This is the largest colony of the Storm Petrels in the world. The mink on Gt. 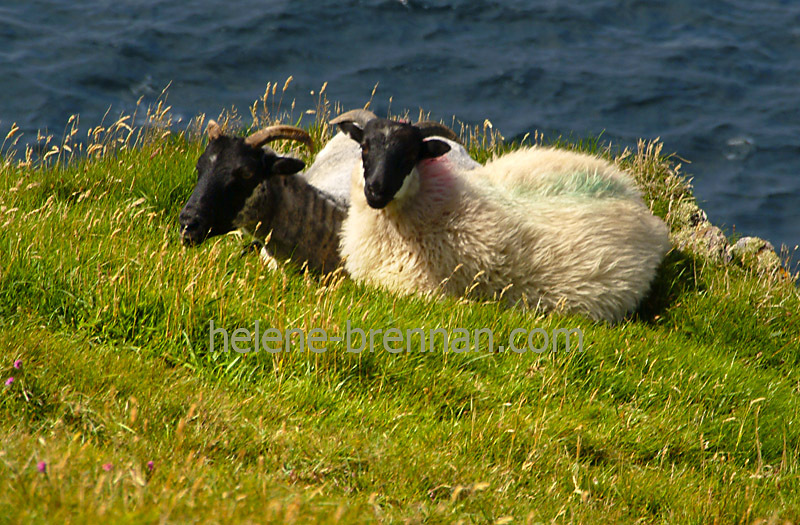 Blasket Island are seen as a serious threat to these ground nesting creatures. 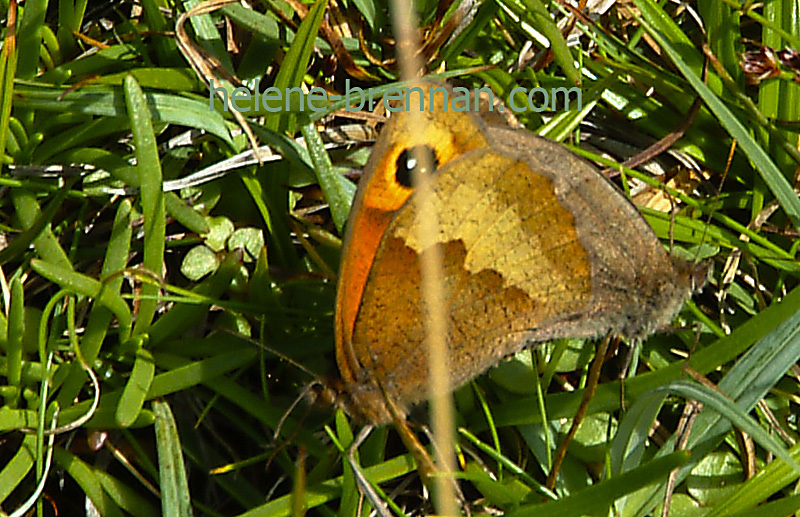 Butterfly, quietly resting in the grasses on the island. There are no rats on the island, and of course most people would want to keep it that way. There is no landing pier there, and there has been much controversy about whether or not to build one. The larger vessels that could land there could potentially carry rats or even other creatures that would disturb the delicate balance of nature. The ferries cannot moor at the small rough concrete slip so passengers have to climb down a ladder into a dinghy, which drops them off at the slip. 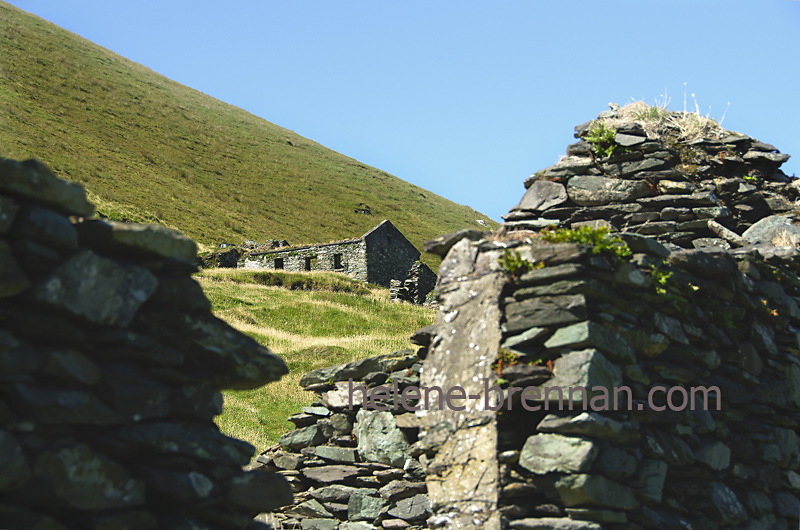 This slip hangs on the end of a very rough rocky and steep approach to the more smooth and grassy but also steep path that leads up and around through the village. Those visitors who have some mobility or fitness issues may find their enjoyment of the island somewhat compromised. The village is built on quite a steep slope. But aside from these inconveniences, I have no doubt that all visitors are glad they made the effort. 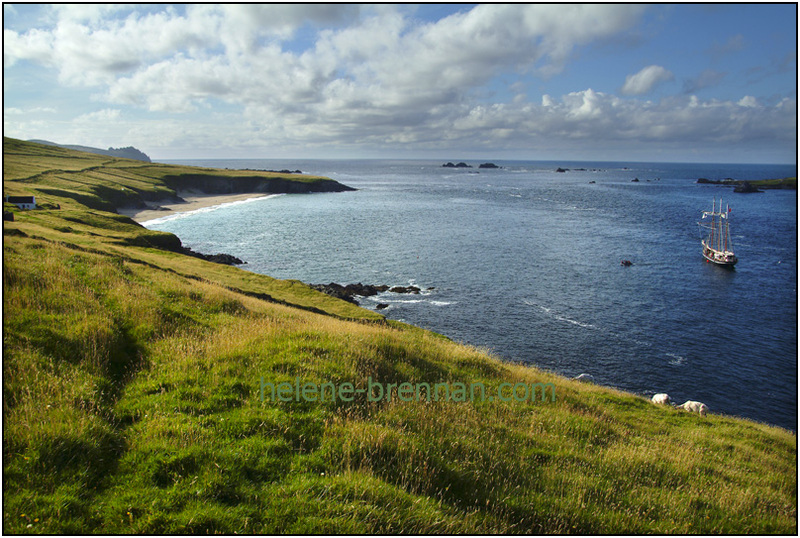 Information about the islands history and heritage is available from friendly guides on the island, and there is usually plenty of time for a trip to the magical beach, or maybe even a long walk along the island, before returning to the ferry. It’s with great reluctance that I leave the island and I always intend to return soon. That’s not always possible. Now that October is here, I don’t expect any more ferries until next year. One day, I’ll get my own boat!